As usual, Dubai will hold the “Global Football” award ceremony this year. 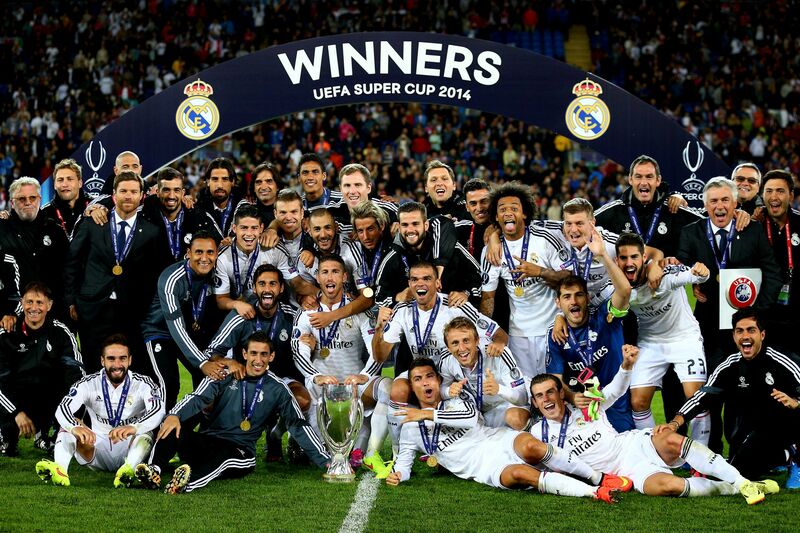 In 2014 Real Madrid with four trophies naturally became the big winner. At the award ceremony last night, C Lo, Ancelotti, J Lo and Florentino got their own trophy. And Di Stefano also to get a lifetime achievement award. 439,765 votes submitted by FIFA fans for 60 countries. The countries Malaysia, Ukraine and India are in the Top 3 list. We take you now to FIFA 15, where a player is clearly about to score … doh!, but he gets the rebound and DOH! Throws game out widow. It’s probably too late to exchange it now, but watch the clip below and lament your choice of this for a Christmas present. During one month, between May and June, EA Sports selects the best players of the season for each of the main leagues and releases them in several teams named Teams of the Season. Alongside the TOTY, this is the moment responsible for the biggest price falls in the game.So,don’t miss this time. The players’ prices fall a few weeks before the release of the TOTS. Anticipating themselves for this moment, many people sell their player. They know their cards will be worth less on the following weeks and many also need coins to invest in packs. The closer it is to the TOTS release, the lower prices will be. Until you reach stage 2 you might not notice very big price falls but it’s always a good idea to sell your cards the earlier possible if your plan is to take advantage of the TOTS to get some FIFA 15 coins. The consumables’ prices remain practically unchanged in this stage since players need them for their squad and probably won’t sell them. Once the first three TOTS are released a very big price fall is noticed. They’ll hit their historic minimum. Many players have sold everything they had and are in this stage spending all their coins on packs. And just like the most basic law of economics says: when the supply exceeds the demand, prices fall; when the demand exceeds the supply, prices rise. In this case the market becomes saturated with players, staff, consumables and club items. That means prices are very low. And it remains this way because players keep on buying packs until the last TOTS. Many players store coins to spend on packs during the best TOTS. Prices remain low until the very end of this stage because players are permanently opening packs. As you’d imagine, many players want their squads back. According to the same laws of the market we mentioned above, prices rise in this stage. However, they don’t go back to where they were before the first stage. Most cards end up stabilizing at a slightly lower price. At a macroscopic scale you noticed what happens. But what about all the way through the TOTS? It’s important to analyse the tendencies during these weeks in order for you to be able to buy cheap and sell expensive during this period. The first thing you need to know is that the day of the first TOTS release is probably the one in which prices hit a historic minimum. From now on prices are particularly low through the weeks of the Barclays PL TOTS release as well as the Bundesliga, BBVA and EAS FC ones, but they don’t fall enough to reach the values of the first day. For one TOTS, the cards’ prices vary along the week, increasing/decreasing more than 20%. Normally they’re lower on the first days and higher on the last days. Monday and Tuesday, for example, are good days for selling. Electronic Arts (EA) always considers players first as its ultimate precedence by offering amazing experiences to the gamers daily. Its players on PC and console registered greater than 1.9 billion hours of gameplay in the quarter already. EA also achieved a record number of mobile gamers during the quarter, with more than 155 million monthly active users on an average for the company’s mobile games.Meanwhile, EA is providing with an incredible and lasting fun and enduring value for its players through all its popular platforms and genres. In the second quarter, EA released several innovative games and services through the mobile, PC and console platforms. Madden NFL 15 was released in August and was accepted significantly becoming the highest successful Madden titles in coming years amid critics and players. Till date, players have played above 89 million Madden games, an increase of 48% on year-over-year basis. EA launched NHL 15 and Sims 4 in September and since then has released several key content updates for players in both these games with enhanced features and varied gaming modes. FIFA 15 exceeded 3.4 million exclusive players in just one day with having merely single week in its second quarter creating a record for its FIFA games. Overall, EA is witnessing approximately 50% greater online player engagement for FIFA 15 compared to FIFA 14 during the previous year. The superb Team modes for FIFA 15, NHL 15 and Madden NFL 15 are witnessing continued impressive growth. Its total base for Ultimate Team player has previously expanded greater than 40% compared to FY14. FIFA 15 Ultimate Team for mobile and Madden NFL mobile has been released for Android and iOS in the current quarter. The company’s EA SPORTS games for mobile added to more than 40 million monthly active users during the second quarter, an increase of 250% on year-over-year basis. Last quarter, we launched EA Access, our new digital service for Xbox One players that allows unlimited play across a selection of EA titles and other valuable benefits for a monthly or annual fee. EA is enjoying healthy digital growth in Asia as well. The revenue for FIFA Online 3 increased 89% on year-over-year basis during the second quarter. In Korea, FIFA Online 3 recorded highest revenue during the second quarter. China and Korea are believed to be major growth verticals for EA and it continues to find better ways to serve more players with its largest IP. In third quarter, EA launched NBA Live 15 and expects to further release Dragon Age: Inquisition in November. EA SPORTS games live services are expected to provide fresh challenges, content and updates to players, combining the realistic events of the NBA, soccer, NHL and NFL season straight to the player experience in its games. For mobile devices, EA is estimated to release two fresh games during the third quarter, Peggle Blast and SimCity BuildIt. Both these games are free to play. Battlefield 4 is estimated to launch its fifth expansion pack, Final Stand, in third quarter, providing solid experience in the game. At present, Battlefield 4 is adding new players and engaging current customers. Going forward, EA plans to keep enough time among releases for allowing customers to completely identify the immersive gameplay experience for the shooter titles. EA targets on launching Battlefield Hardline on March 17, 2015, in North America and later in Europe. After this release, its next Battlefield experience is forecasted to be launched in third quarter of FY17. In the subsequent holiday, EA plans to launch a fresh hit, Star Wars Battlefront, from its DICE Studio in third quarter of FY ’16. Thus, EA looks like a good bet for the long run. So, investors should definitely consider investing in this stock. A repetitive game that obsoletes your repetitive efforts within weeks is a recipe for disillusionment. Look at Reddit and these forums. One week after seeing their raid gear become useless and seeing weeks of the same cycle ahead, more players than usual are saying enough is enough. Among those staying, more than a few say they love and hate the game simultaneously. It’s what drug addicts say. We have to understand the mood of the players. Do you want to becomemore powerful? Click here to view more latest Destiny’s Dark Below news and Guide. You can buy destiny power leveling with cheapest price by destiny-store coupon: destiny. In the latest FIFA 15 advert for Christmas, a virtual battle between Lionel Messi and Eden Hazard is held in advance. Let’s take a look at what’s going on there and ways of getting FIFA 15 coins. EA FIFA 15 afresh appear a cast new advert themed Christmas. It featured Lionel Messi, Eden Hazard and lots of singing Christmas decorations. During the commercial, Messi and Hazard had a basic football bout in FIFA 15. At first, Hazard took the beforehand by scoring an bright flick with himself on the accepted football video bold FIFA 15. But the Argentine superstar can’t be denied for too log, he eventually ran bright of Hazard’s FIFA appearance afore angle the brawl above Thibaut Courtois and into the top corner, a archetypal Messi goal. Messi and Hazard played a 1-1 draw at the end of the Commercial. FIFA 15 makes Messi and Hazard play adjoin anniversary added in advance. Actually, a bout amid Barcelona and Chelsea area Lionel Messi and Eden Hazard accord to appropriately ability appear in this division of UEFA Champions League. Real action amid them have to be admirable then. But now, back FIFA 15 is a ablaze football video game, FIFA 15 players can accomplish this ablaze arena by basic your own FUT 15 team. Buy cheapest FIFA 15 coins Xbox 360 or added adaptation coins to body your own FIFA 15 Team now. Ever since the Christmas themed advert is released, FIFA 15 fans show great interests in it. By watching Hazard and Messi play scorpion tail pendulum and flea goal, FIFA 15 players get encouraged to continue play FIFA 15 which is awesome. Though flawless, FIFA 15 give football fans a great experience in video game. Anyway, FIFA 15 brings us great fun in boring daily life.Have fun!